Hybrid Perpetual. The flowers of ‘Queen Victoria’ are white, shaded with pink, very large and full, globular in shape, on a vigorous shrub. [Paul (1848, 1863, 1888), Rivers (1854), Henry Curtis p.7 vol.2/1853]. Seedling of ‘La Reine’ probably bred by Fontaine in 1850, although its origin is in doubt. It was introduced to Britain by William Paul in 1851. 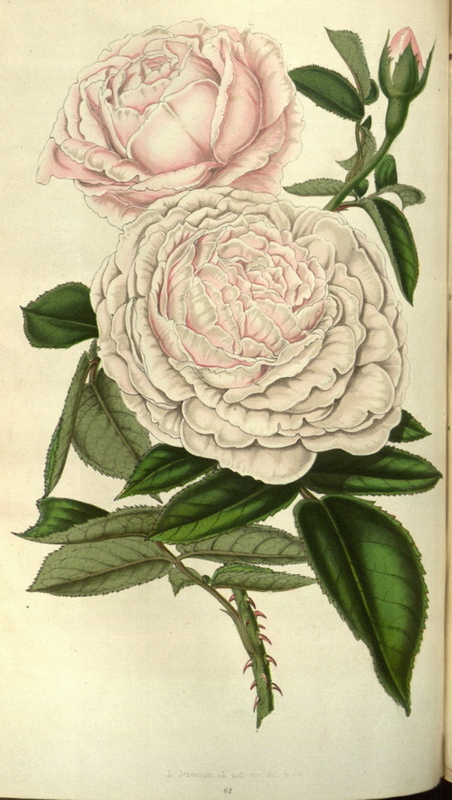 It was figured in the Floricultural Cabinet with the comment: ‘Bred from ‘La Reine’, of which it is an exact copy in every respect save colour, that it has been designated the ‘White La Reine’. The ground colour is white, overlaid with the most delicate hue of pink, and of wax-like appearance. It is very distinct from any other rose. The full blown flower is of good size, and will prove a charming companion to the higher coloured ones.’ [FC p.1/1852]. Louis van Houtte included ‘Queen Victoria’ in an Énumération des plus belles variétiés et….des autres!, all Hybrid Perpetuals, in the Flore des Serres. [FS pgs.91-102 vol.15/1864]. It was also figured in this journal in 1852. [FS f.691/1852]. 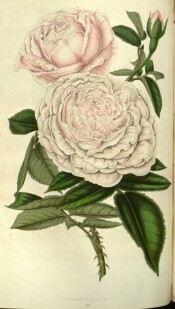 Macarthur’s rose is clearly listed among the Hybrid Perpetuals in his 1861 list and should not be confused with the rose called ‘Queen Victoria’ described in the ‘Gardeners' Chronicle' of 1847, and by Paul, a Tea-scented China with lemon-coloured flowers, closely resembling the Tea rose ‘Princesse Adelaide’.